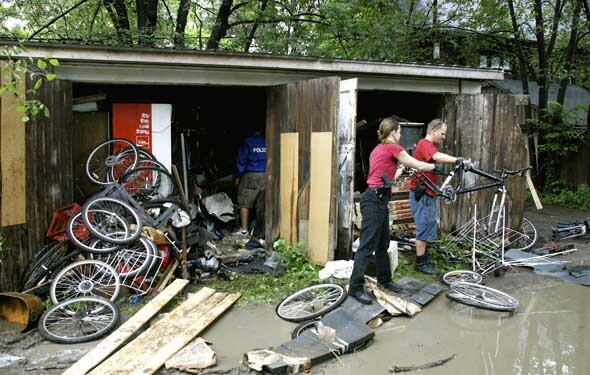 I watched in amazement as dozens upon dozens of bikes were hauled out of a garage in a Parkdale back alley at 54 Elm Grove Avenue near Queen St. W. and Brock Ave. There was even a child's tricycle among the recovered loot. Superintendent Ruth White of 14 division was on hand to unveil the Toronto police's latest cache of bikes traced back to Igor Kenk and his Bicycle Clinic. "The garage had been rented out since March 2008," said Supt. White. "It's owned by a numbered company. "The guy who rented it out came forward and gave us a statement. A total of eight search warrants were issued since Thursday's raid on Kenk's bike shop." 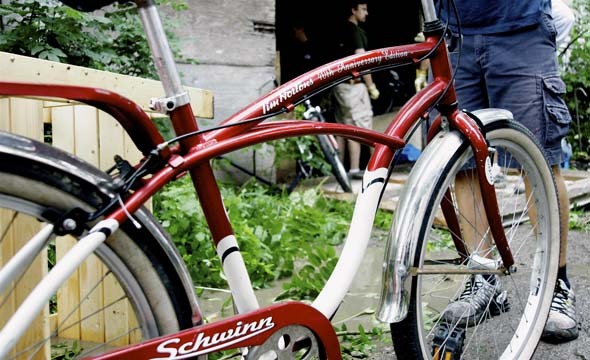 An additional 250 bikes were found today in a double-car garage on High Park Blvd. between Roncesvalles and Parkside Drive. 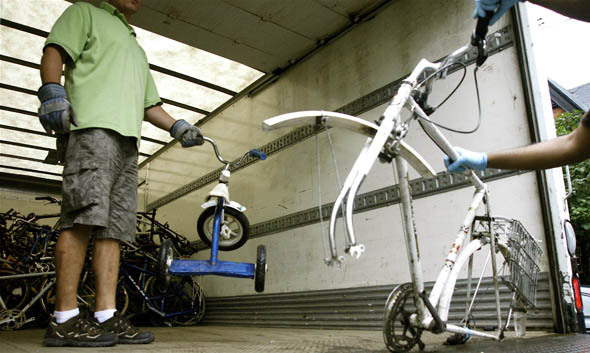 Police filled three big trucks with recovered bicycles today. This adds about 450 more bikes recovered, bringing up the total number of bicycles seized to well over 2000. As half a dozen police began hacking away at one end of the garage with bolt cutters, I could see bikes and bike parts piled up to the ceiling. And that was only the beginning. "There's a rebar attached to a two-by-four, attached to four-by-sixes," shouted out one of the police, as he tried to open up the second garage door. "It appears to be locked from the inside." There were actually about four or five interconnected garages, all boarded up and locked down. Once police got into the first space, they realized the whole row of garages in that alley were filled with bikes. Out came a Specialized Rockhopper Hardtail. "That's the same bike as the one I bought for $960 new back in November 2006," said Det. Izzy Bernardo (pictured below) with the Major Crimes Unit, 14 division. "It's exactly the same as mine, but without its pedals. They take the pedals off sometimes because they get all jammed up in garage with the pedals on." Helping out with the removal of all the bikes was a team of 80 young men and women between 15 and 18 years old. "We're putting the bikes in the trucks and helping out the police," says Vinny Chan, 16. Chan is one of the 100 youngsters involved in the Youth In Policing Initiative. Not a bad job for $10.90 an hour. Chan says she's working a seven-hour shift today. She says it's rewarding work, helping others get their bike back, having had a bike of her own stolen just two years ago. They've been helping process and tag all the bikes hauled in over the past week or so. Just then a kinda unique bike emerges from the stacks of bikes coming out of the garage. "There's a Tim Horton's bike," exclaims one of the police. "That's where we're going after this." About half an hour later it's break time and a take-out order of Timmy's arrives. It seems like opening up the first garage upset a beehive. When the police get back to work in the next lot of garages they've got face masks on. Who knows what other hazards await inside amongst all the other bike parts, scrap metal and detritus. 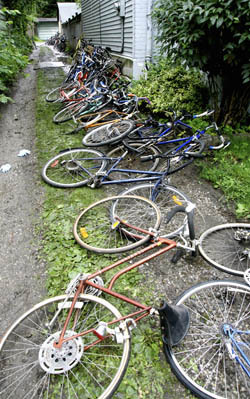 After an hour or so, over 450 bicycles were extracted from the garage and hauled away. Once recorded and catalogued, these bikes will be on display along with the others seized this past week for the original owners to come and retrieve. The police need to find a warehouse space large enough to accommodate their escalating stash of bikes, which they hope to have on display this weekend. Nearby resident Jessica Johnson says she's had two bikes stolen in the past five years. "It's one of the meanest things you can steal from somebody," she says. "People have personal relationships with their bikes." Johnson even names her bikes. Steve was stolen after she had Stella stolen. "I haven't named by current bike," she says of her Giant FCR3. "I don't want to jinx it." Parkdale resident Diane Smith says she had no idea all these bikes were hiding in a garage in her neighbourhood. "The owners of the garage probably didn't even know they've got stolen property in there." Smith is upset the police took so long to take bike theft seriously. "When I discovered my last bike was stolen about three years ago, there was a cop across the street and he said to check Igor's bike shop. Why are they only investigating him now? They could've set up a sting operation years ago." On Tuesday afternoon, police arrested a woman in connection with this investigation. Jeanie Chung, 37, of Toronto, has been charged with possession of property obtained by crime, possession of cocaine, possession for the purpose of trafficking cocaine and possession for the purpose of trafficking marijuana. She is scheduled to appear in court at Old City Hall on Friday. 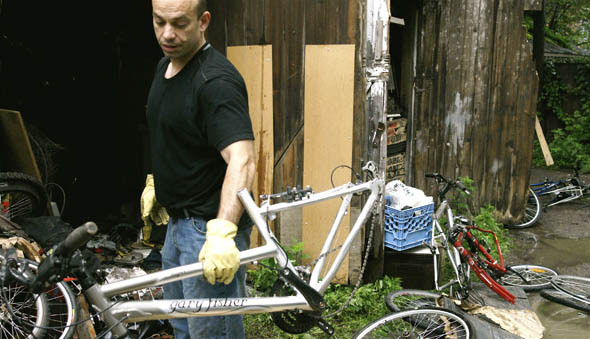 Let's hope that this is only the beginning in Toronto's bike theft recovery investigation. And that 52 division has their sights on "Uncle Jacob," whose bike shop on Spadina has been under suspicion for some time.